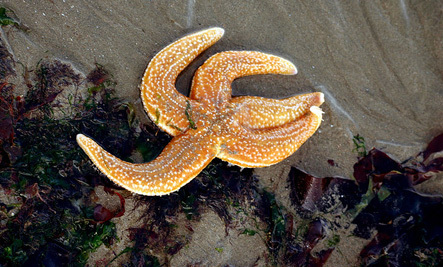 A mysterious disease that has been claiming the lives of starfish (or sea stars) up and down the US, Canadian, and Mexican coasts since last summer has now wiped out as much as 60% of the populations of purple ochre sea stars being watched in Oregon—populations that as of April had seen less than 1% of its numbers affected. Creatures suffering from the “sea star wasting syndrome” first cross their arms, then break out in white lesions that turn into holes, and ultimately disintegrate to the point where their entire arms can turn to goo. And while wasting is not a new occurrence, “usually it’s very localized to a single site or single region,” which healthy neighboring populations can recolonize, biologist Bruce Menge tells Live Science. "One biology professor studied sea stars suffering from what is being called "sea star wasting syndrome," and he tells PBS the starfish first twist their arms into knots, then literally "[start] ripping themselves apart," he says. "The arms just crawl away from the particular body," crawling in opposite directions until they tear off; the sea star's insides then pour out, and the arms never regenerate, as they would in a healthy starfish." I agree. They are probably trying to cover up for the fukushima disaster. They are already feeding us nuclear tuna but they don't want to ruin "the economy" by saying the beaches are contaminated. I personally believe we're seeing only the initial wave of the devastation coming from Fukushima. This is a curse that will last for thousands of years, and doom ALL life forms it touches. Look at the stats for Chernobyl: THAT disaster is STILL playing out. And let's not forget the THOUSANDS of tons of DU spread over Iraq, where deformed babies are the order of the day, and ALL terminal diseases have skyrocketed. Amerika: It succeeds where Hitler & Stalin failed!! I read a similar article that said, "Scientists are baffled"...really? This couldn't have anything to do with Fukushima? *rolls eyes* I'm no scientist, but that would be the first place I'd investigate and the first thing I'd put money on! Great, yet another terrible thing occurring! I'd bet that global warming is the cause, and/or the fallout from Fukushima or some type of oil spill or water pollution. Let's face it: it could be any number of things but chances are you can trace it back to the humans! I, too, bet it's global climate change.